The other day, I was sitting on the couch at parents’ house and picked up a copy of Fortune 500, the annual list of America’s largest businesses. Like most people, I look at the top companies, but I also look for other things. How many are based in Tennessee? How many are new additions? How many dropped out? There is a lot of interesting information once you start digging in. This year, I noticed something else. It was not that long ago that the History Channel put out a program called The Men Who Built America about the big industrialists of the late 1800s. It covered Cornelius Vanderbilt, Andrew Carnegie, John D. Rockefeller, J.P. Morgan and Henry Ford. There were others, but those guys were the main characters. As I thumbed through the Fortune 500, I thought back to those men and wondered how many of their companies are on the 2014 list. Obviously, Ford Motor Company is going to be on there. Heck, everyone has seen a Ford vehicle going up and down the road. But, what about those other guys? Cornelius Vanderbilt was into ships and railroads. In the old days, his companies dominated, but I could not find any of them on the current list. Andrew Carnegie made his fortune with Carnegie Steel. He sold out and spent the rest of his life giving money away. Carnegie could do that because he sold the company to J.P. Morgan, and this is where things get interesting. Morgan learned investment banking from his father and took it to a new level. He bought Carnegie Steel and merged it with another mill to form U.S. Steel, which currently ranks 166th on the list. Morgan also owned General Electric, currently the 9th largest company in the United States. However, that is not all. He was also on the ground floor of American Telephone and Telegraph. We know it better as AT+T, and it ranks 11th. 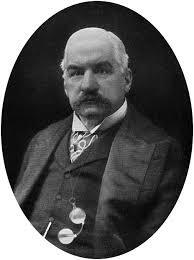 This means that J.P. Morgan owned three corporations that currently rank in the Fortune 500. But, there is more. J.P. Morgan Chase and Company is the 18th largest business in the country. 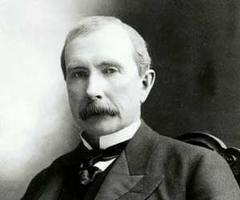 Then, there is the story of John D. Rockefeller, who owns Standard Oil. He created a trust system, which allowed him to controlled the vast majority of the world’s oil supply. The United States government, fearful of an important resource being controlled by one person, busted the trust into smaller companies. Being a major stockholder in the new companies, Rockefeller became the richest man in the world. In other words, the federal government really showed him. Anyway, a few of those smaller companies still exist. Exxon Mobil ranks 2nd. Chevron ranks 3rd. Marathon comes in 25th. The History Channel called them The Men Who Built America. Others call them robber barons for their ruthless business techniques. Regardless of what one might think of them, there is no doubt that they played major roles in the American economy. What is more, they continue to play major roles many decades after their deaths.